Nourishing and moisturising post-waxing treat for the skin. 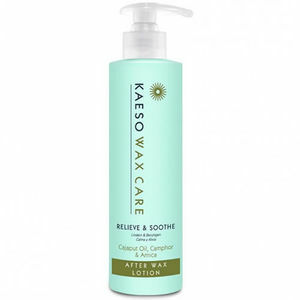 Kaeso Relieve & Soothe After Wax Lotion is just the soothing ticket for post-wax irritation. Containing the ingredients Camphor, Cajaput Oil and healing Arnica to diminish any signs of hair removal, this lotion works hard to leave skin looking soft and supple. 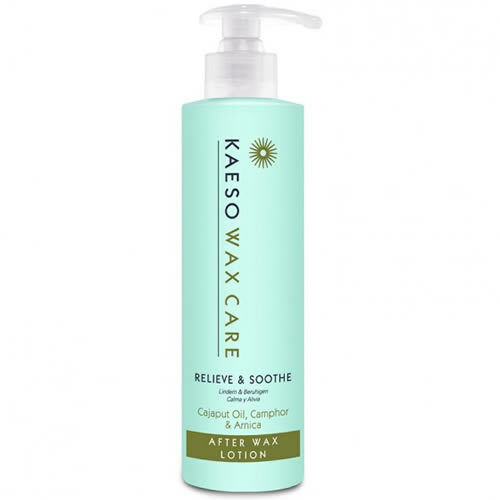 Nourish your clients' skin and reduce redness with this caring product from Kaeso. Available in a 495-ml bottle. £4.38 (inc. VAT) Why no VAT? We're a trade wholesaler and quote our prices without VAT to help our VAT-registered customers understand the true cost of a purchase. Effective multi-purpose cleaner for removing excess wax and spillages from your waxing equipment. Soothing and calming post-waxing gel that contains Aloe Vera, Camphor, Cajaput Oil, Arnica and healing Argan Oil. Amazing quality... The best I've ever used! If you're looking for pure precision and comfort of use then this is the only one to go for in my opinion. Love it!